It’s a stupid little joke, but it highlights an important lack in our education. I saw it as a cartoon in a magazine when I was a child. I understood it at once, but only because I had a good classical education. Euripides was, of course, a great Greek tragedian (ca. 480-406 B.C. ), author of Medea and eighteen other surviving plays. But who was or were the Eumenides? Eumenides was the name of a play by Aeschylus in the Oresteia trilogy, which also consisted of Agamemnon and The Libation Bearers. 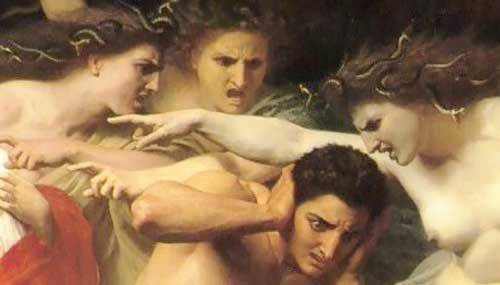 Another name for the Eumenides is the Erinyes, probably better known as the Furies, Greek goddesses of vengeance, mostly invoked by the gods when someone has sworn a false oath. I believe the Eumenides gave George W. Bush a hard time over “weapons of mass destruction” in Iraq, from which he is still suffering. By the time I was in high school, I had read Edith Hamilton’s The Greek Way and The Echo of Greece, as well as a number of the Greek tragedies, so I was fairly conversant with classical literature. Now virtually no one reads the works of ancient Greece and Rome, let alone books about them. But that’s where it all began. If you don’t know your origins, you won’t know where you’re headed. This entry was posted in meditations and tagged ancient-greece, classics. Bookmark the permalink.